A sturdy, reliable defender, Williams was respected as a great clubman at both Essendon and Collingwood. Recruited from Rochester, Williams was a solid, dour performer who could shut down opposing centre half forwards. He was captain of the Dons for one week when five players went on strike over a pay dispute. Williams’ greatest individual honor was running equal third in the 1972 Brownlow. He went to Collingwood, but had knee problems and went under the surgeon’s knife. Williams was centre half back in the 1968 Grand Final side. 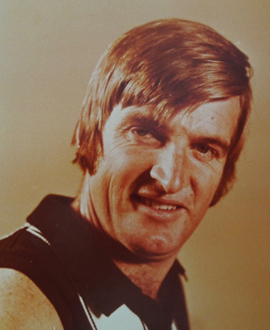 He played for Victoria four times and was an All-Australian in 1972.